Top-ranking senators have introduced an omnibus health-care bill that would add severely disabled people to the Medicaid rolls and abolish restrictive certificate of need laws. Sens. 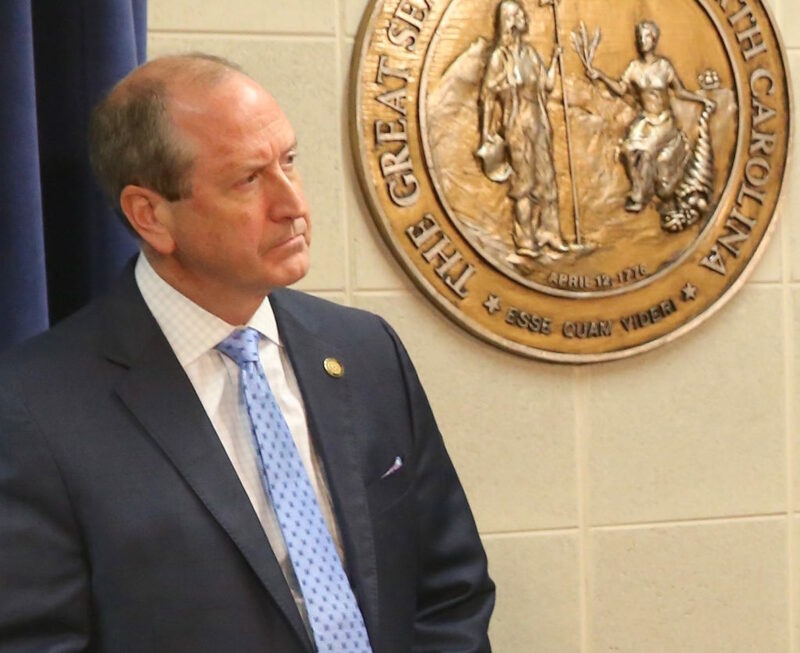 Joyce Krawiec, R-Forsyth, and Dan Bishop, R-Mecklenburg, discussed Senate Bill 361, The Health Care Expansion Act of 2019, at a March 26 news conference. It also would create a multi-state psychology compact and expand categories of mental health providers who are authorized to perform psychological services. Krawiec said Democrats have tried for years to expand Medicaid to hundreds of thousands of able-bodied adults. They are pushing House Bill 5 and Senate Bill 3 this session. Republicans have prioritized truly needy people with intellectual and developmental disabilities, she said. That includes people with spinal cord and traumatic brain injuries, and an array of mental, behavioral, and physical problems and disorders. S.B. 361 would appropriate $41 million, adding 2,000 IDD Medicaid innovation waiver slots over the next two years. There are 12,000 IDD patients on innovation waivers, with an equal number on a waiting list that averages seven years to get services. “By funding more slots on the IDD wait list we’ll be changing the lives of thousands of families across North Carolina,” Krawiec said. Families will get in-home and personal care services they need to free them up from round-the-clock care. Donna Beckmann, advocacy director of the Triangle Down’s Syndrome Network, attended the press conference with her son Thomas, who wants to live independently and be a productive member of society. “He might not be able to tell you his phone number, but he can use power tools,” and makes wooden signs, Beckmann said. “He has a bright future, but we can’t get there without the innovations waiver.” The waiver would let both of them work after he finishes high school. Otherwise, she would have to quit her job to stay at home with him. By contrast, Democrats want to expand Medicaid mostly to able-bodied, childless adults, Krawiec said. They might get an insurance policy, but not access to health care. While Medicaid has grown by 1 million enrollees over the past 15 years, the number of doctors accepting Medicaid patients has declined 28 percent. “Until all of the truly needy on that IDD list are taken care of, we should not even be considering expanding Medicaid” to healthy people, Krawiec said. States that expanded Medicaid reduced programs for the most vulnerable people with multiple and complex needs, she said. Bishop said expansion states experienced costs two to four times original projections, causing budget cutbacks elsewhere. “It is frankly a reckless approach,” Bishop said. Both senators said it’s highly improbable the federal government would continue funding 90 percent of the Medicaid expansion cost and noted most of the expansion money is borrowed, increasing the federal debt. Krawiec said the federal government already announced it will reduce its funding share of the N.C. Health Choice program for children’s Medicaid by 11 percent in the coming year, and 11.5 percent the following year. “That’s going to be about a $100 million budget hole that we will have to fill,” Krawiec said. The bill would abolish all of North Carolina’s certificate of need laws, which restrict providers from opening certain medical facilities, buying high-cost equipment, and performing some services unless they pass through an expensive maze of government mandates. “In practice, CON laws put government control ahead of patients and doctors, handcuffed health-care providers from offering care in their communities, increased health care costs by stifling competition, undermined the doctor-patient relationship, and added anxiety about the quality of care to those who were most vulnerable,” Bishop said. He said S.B. 361 would increase provider competition, enhance patient choice, lower costs, and improve access. The legislation creates a compact among seven states to authorize telepsychology and temporary, in-person psychological services across state lines without requiring a licensed participant to get additional licenses in other states. “It’s a groundbreaking innovation, and it would address the increasing demand for psychological services,” Bishop said. It would target underserved and geographically isolated areas, such as rural communities. The bill also would allow licensed family and marriage therapists to conduct initial evaluations needed for an involuntary mental health commitment. They’re trained to meet federal standards to diagnose and treat core mental health conditions. But North Carolina doesn’t let them do commitment evaluations despite a severe shortage in psychiatrists and psychologists who are allowed to perform the task.